The Ox Bender is a great tool to bend metal. Sadly, unless you have hands of steel, you will not bend a quarter using one hand like Menny suggests. If you're a woman or child, forget it. You need huge, strong hands to bend a quarter. If you spend about 20 seconds squeezing very hard you can put a slight bend in it, but it's very difficult and it hurt my hand. 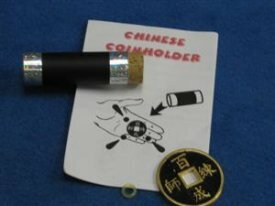 A nickel is easier but still difficult and a dime is very easy but cannot be done without aligning the coin visually in the device, which throws a ton of suspicion on your hand. Menny doesn't tell you any of this before you spend the $100 and find out for yourself. I wish I could get a refund because I will never use this to bend a quarter...ever. Fork bending...yes. Quarter bending...No.